Observations in my outdoor terrarium. Introduction and description of the outdoor terrarium. In 1995 I built an outdoor terrarium in my garden after I visited my (late) friend Udo Strathemann who kept several Garter Snakes (Thamnophis spp,) and the Northern Water Snake (Nerodia sipedon sipedon) year-round in his garden in an outdoor terrarium (Strathemann, 1995). He had built his outdoor terrarium in the middle of his garden so that it was in full sunlight without shade for the entire day. I still remember this visit quit vividly: it was early spring and despite the weather was cloudy and (in my opinion) a bit cold for the snakes to be active we witnesseda few Garter Snakes (Thamnophis radix and Thamnophis sirtalis parietalis) “basking” between rocks and high grass. I was so thrilled to observe the snakes out in the open (it felt like observing snakes in their natural habitat the US) that I decided to start building one for myself right away. An outdoor terrarium really gives you a unique opportunity to learn much about the behaviour of Garter and Water Snakes in the wild, especially how they react to climatic conditions and temperatures. It is a great addition to keeping the snakes in a terrarium. My outdoor terrarium is L-shaped and built against the back of my shed, and the brick wall acts as the back side of the terrarium. Length and width are 3 x 4 meters and the surface should be approximately 10m². 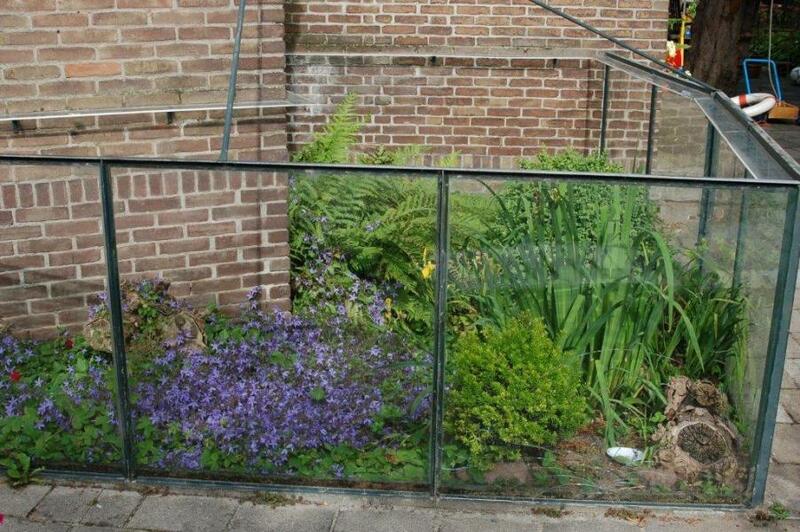 The 3 other (then the brick wall) sides consist of 0.8 x1 meter glass panels in a iron frame used for greenhouse construction (I live in between the greenhouses). The iron/glass construction is built on a concrete foundation. (50 cm high, of which 40 cm is underground to prevent mice and rats from digging in). 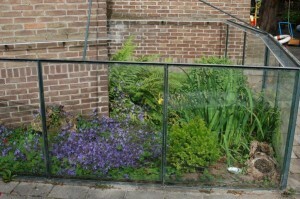 A small strip of 10 cm glass is placed at a right-angled position to prevent snakes from escaping in case the glass is wet and juveniles could crawl up along the glass. A small pond and a marshy area are constructed out of plastic used for garden ponds. 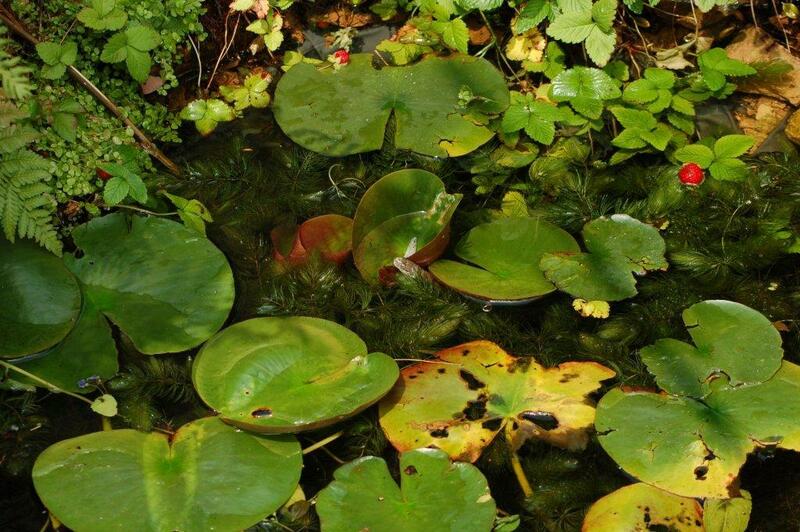 The pond is about 80 x 80 cm and also about 80 cm deep. In the pond a water lilies and some other water plants grow. Out of wood a hibernaculum is constructed which enables the snakes to crawl about 80 cm deep below the surface. This should be deep enough to keep them from freezing in the winter. Since the soil is heavy clay they (probably) cannot crawl in the soil by themselves. Whether all snakes use the hibernaculum is unsure, and once I checked very early in spring and hardly found any of the snakes hibernating there. The snakes also might hibernate for instance in the pond, which has been described in literature. Or between the plastic of the pond and the soil. Karkos (2009) describes how a Thamnophis radix spents the night on the bottom of the pond after a nightfrost in February. And survives this without a problem. My terrarium is oriented in a south-east direction which is sub-optimal. Because of this orientation it catches in the summer the morning sun but after noon it becomes more and more shady (because my shed is “in the way”) and around 3 PM only a very tiny patch catches the last sunrays. In late spring and early fall this is worse due to the fact the sun is so low and the sun only shines 2,5 – 3,5 hours. This was the situation when I built it. Over the years the situation changed: trees in the garden of my neighbour have grown ( I offered to “prune them” but he did not accept my offer) and a wooden fence has been placed. Now the sun can hardly shine in the terrarium in the “winter” months anymore (mid-October to mid-march) even if it is sunny. A good outdoorterrarium in the dutch climate should be built on a place that has sun (without shade) from early morning till sunset. The fact that the terrarium receives most of the sun in the morning is very relevant. On top of the fact that the dutch climate is very unpredictable and sunny days can be scarce also the timing when the sun shines can very a lot. Since I live close to the ocean (about 5 km) strong winds tend to blow away the clouds during the day and second part of the day tends to be quit sunny in spring time. But this does not help my snakes, so they cannot profit of this important opportunity. The plants used in the terrarium are mostly chosen because of their ornamental value, whether they like to grow in the outdoor terrarium and because they do not grow too high. Be aware of fast growing plants which can enable the Garter Snakes to climb up and escape. Especially plants like ferns can fold out leaves in spring quit rapidly which are firm and can grow quit high!In the last 10 years or so more and more people are getting very enthusiastic so several articles have been written (many of them in the “Garter Snake”, the magazine of the European Garter Snake Association) and Martin Hallmen (2003) has written an excellent book entirely on this subject (plus many articles in the “Garter Snake” about all the various Garter Snakes he successfully kept over the years outside). I have kept several species in my outdoor terrarium, amongst others Thamnophis sirtalis sirtalis (regular plus melanistic) (Bol, 1997), Thamnophis radix and Nerodia sipedon sipedon. 2.1 Thamnophis sirtalis pickeringii (red morph) from BC, Canada. The climate in BC is very comparable to the west of Holland where I live, only summers are slightly better/warmer. 4.8 Nerodia sipedon insularum from Southern Ontario, Canada. The climate is not comparableto the western part of Holland with very long cold winters and relatively hot summers(latitude of Northern Spain). But at least they can handle long cold winters. 1.3 Thamnophis radix from several breeders (unknown origin, but since T.radix occurs quit farnorth up to southern Canada they should be suitable for keeping outdoors). With unknownorigin of the snakes it always remains a guess, since T.radix also occurs as south as Texas. But at least it is used to a land climate with cold to very cold winters throughout its range,although this is not comparable to the Dutch coastal climate). Several members of the EGSA (European Garter Snake Association, see link on my website) have experimented with keeping also more southern occurring species of garter snakes and even snakes like Thamnophis atratus and Thamnophis marcianus have successfully survived year round outdoors and even managed to produce some young. A lot will depend on the orientation of the terrarium (the numbers of sun hours), local climatic conditions and also the soil structure (dry, sandy soil versus moist clay soil). I will try to update regularly any observations made in my outdoor terrarium throughout the year. So you can witness how a year of a snake outdoors differs from our terrarium snakes. Bol, S., 1997. 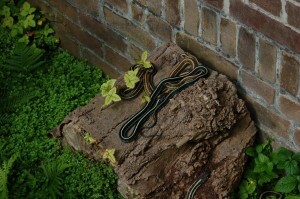 The melanistic “common garter snake” in the outdoor terrarium (part2). The Garter Snake 2(3): 8-22. Karkos, U., 2009. Überraschende Beobachtungen und ein Sommer in der Freianlage. The Garter Snake 14(4):11-15. Hallmen, M., 2003. Freilandterrarien für Schlangen. Natur und Tier Verlag, Münster, Deutschland. Strathemann, U., 1995. Freilandhaltung nordamerikanischer Wassernatter der Gattungen Thamnophis und Nerodia. Sauria 17(1): 31-34.